I recently installed a Mazdatrix short throw shifter. This is a very nicely made piece and which is sold at a considerable price reduction over the comparable MazdaSpeed and C's short shifters. So at $209 for the Mazdatrix unit the price was, I think, more reasonable. The kit came with the shifter arm, alloy spacers, new upper and lower bushings, new wave washers, all necessary gaskets & shims, and a new stock inner boot. The inner rubber boot on my old shifter was so brittle it literally disintegrated in my hands when I removed the shifter, and my car only had 34,000 miles on it at the time. The new shifter installed in about 2 hours, taking my time, which included panel removal (I have some unique wiring with the turbo timer location and PFS PMC switch in the ashtray) and a bit of extra work to make the Momo shift knob sit flush with the leather shift cover. The supplied installation instructions were marginal. 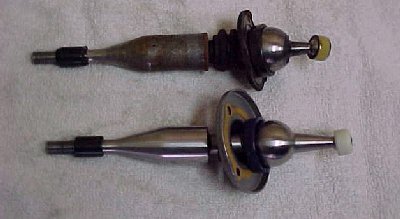 I did notice the OE shifter had a nice urethane insert in the main ball fulcrum groove, the Mazdatrix did not. Also, I only used one of the shims provided. I probably should have used both but like I said, the instructions weren't very clear on the subject. I have yet to use the shifter on the track so the jury's still out on whether or not it was worth it but I still think it's a nice mod nonetheless and one of the easiest I've ever done. Below are some pics of the install in progress. Click on them to see full size images.